Greater trochanteric pain syndrome (GTPS), also known as Greater Trochanteric Bursitis or Gluteal Tendinopathy, is a syndrome defined by tenderness to palpation over the greater trochanter with the patient in the side-lying position. GTPS refers to a chronic regional pain caused by a number of disorders of the peritrochanteric space, including structures as the trochanteric bursa, the gluteus medius and gluteus minimus tendons and the Iliotibial band. It is a combination of both gluteal (buttock) tendon injuries (tendinopathy) and bursitis (inflammation of the bursa) surrounding the hip joint. Previously, trochanteric bursitis was seen as the main pain source, but recent research indicates tendinopathy of the gluteus medius and minimus tendons are the primary local sources of lateral hip pain. The greater trochanter is situated on the proximolateral side of the femur, just distal to the hip joint and the neck of the femur. On this bony outgrowth (=apophysis) tendons of the gluteus minimus, medius and maximus and the tensor facia latae attach. The last named muscles keep the Iliotibial band (ITB) tense. The tension could also be raised due to contraction of the Vastus lateralis, which has some fibers on the greater trochanter. Due to contraction of these muscles there can be a lot of friction generated in the GT area. The ITB moves back and forward a lot when we walk or run. When we flex our hip the tensor fascia latae contracts and pulls the ITB forward over the GT. In the opposite direction when we extend our hip, the ITB goes backwards over the GT due to the contraction of the gluteus maximus. Friction in the GT area is absorbed by three major bursae (trochanteric bursa, subgluteus medius bursa and subgluteus minimus bursa). These bursae locations vary greatly when observed on cadavers. There can be different amounts, different sizes and different locations of the bursae. The hip joint is innervated by rami articulares of the obturator nerve, the femoral nerve and the sciatic nerve. Recently, researchers discovered a small sensory nerve, a branch of the n. Femoralis, that supplies the peroisteum and bursa of the greater trochanter. This discovery may be useful to improve therapies, such as interventional denervation of the greater trochanter or anatomically guided injections with corticosteroids and local anesthetics. Several pathologies can cause greater trochanter pain syndrome. Greater Trochanteric Pain Syndrome can be caused by direct trauma from a fall onto your side, prolonged pressure to the hip area, repetitive movements (walking/running), commencing unaccustomed vigorous exercise, weight-bearing on the one leg for long periods, hip instability or the result of a sporting injury. Originally, they thought that an inflammation of the bursa, which is situated in the greater trochanter between the gluteus medius and minimus, was the main cause of greater trochanter pain syndrome. The inflammation of this bursa can be painful in the hip and tenderness over the upper part of the femur can occur. After some investigation, it was discovered that the main cause of greater trochanteric pain syndrome is a pathology of the tendon of the hip abductors. More specific the gluteus medius but also gluteus minimus and tensor fascia latae can be affected. These tendons can inflame which leads to a secondary inflammation of the bursa. The tendon pathologies are on the hip abductors which run over the great trochanter. It causes pain because of a tear or inflammation of the tendon. The tendon will degenerate and become weaker. Another cause is the iliotibial band which also runs over the greater trochanter. Due to the tightness of the iliotibial band it can inflame and irritate the bursa associated with the gluteal tendons. Overuse and tightness of muscles can have their origin in contact sport or traumas, as for example after a fall. Oedema between the hip abductors and around the greater trochanter can also cause great trochanter pain syndrome. GTPS seems to be relatively common it affects 10 to 25 % of the general population. They also concluded there is a higher prevalence of GTPS in women and in adults with ITB pain or knee OA. The syndrome mostly strikes at the age between 40 – 60. Also long distance runners are mostly affected by the syndrome. The main symptom of GTPS is pain and tenderness along the lateral zone of the thigh. The pain may radiate down the lateral thigh and lower buttocks, but is rarely situated on the posterior thigh or distal to the knee. It can be described as aching and intense at times of greater aggravation, caused by passive, active and resisted hip abduction and external rotation. It is often characterised by the ‘jump’ sign where palpation of the greater trochanter causes the patient to nearly jump off the bed. Pain is usually episodic and will worsen over time with continued aggravation. Pain is worse when lying on the affected side especially at night. Pain following weight-bearing activities - walking, running. There may be hip muscle weakness. Often the terms Greater Trochanteric Pain Syndrome (GTPS) and Trochanteric Bursitis (TB) are used at the same time. Actually, GTPS is defined as tenderness during palpation over the greater trochanter with the patient in a side-lying position. This does not match with the term Trochanteric Bursitis, which describes the presence of an inflammation. Pain in this region is often not associated with signs of inflammation such as warmth, erythema, or swelling. The aetiology is not fully known, this means that it can relate to myofascial pain rather than to an inflammation. Another diagnosis in this area can make reference to the overlying tissue as the iliotibial band (ITB). This can contribute to trochanteric pain by adding stress to the area. Also osteoarthritis of the lumbar spine, hip or knee can contribute to trochanteric pain by adding stress to the area. After investigation by Neil et al (2007), it is significantly associated with GTPS. Lower limb biomechanics can be related witch GTPS. The diagnosis can be made firstly by physical examination of the greater trochanter. This is done by palpation of the greater trochanter with the patient in side-lying position. GTPS can be diagnosed if there is point tenderness in the posterolateral area. The following tests can be used to diagnose GTPS. Standing during 30 seconds on one leg. 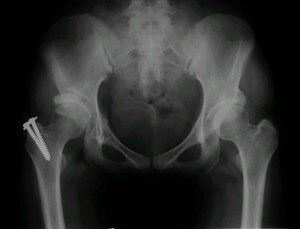 When the patient feels pain in the hip area he has to mention it. When there is pain, the test is positive. By a study of Lequesne M. et al. the specificity were 100% and 97.3% respectively. We can conclude this test can be used for the diagnosis of Greater trochanteric pain syndrome. The patient lies on his back with his hip and knee at a 90° angle. The hip is in external rotation. This is already painful so the patient should be asked to reduce the angle of the external rotation until the pain disappears. The patient is then asked to reposition his leg on the axis of the table whilst applying resistance. The test result is positive when the usual pain is reproduced. By a study of Lequesne M. et al the specificity were 88% and 97.3% respectively. We can conclude this test can be used for the diagnosis of greater trochanteric pain syndrome. Physical examination reveals point tenderness in the posterolateral area of the greater trochanter. Also, pain with passive and active internal rotation and reproduction of symptoms with resisted hip abduction. Trendelenburg Test: This test consists of standing on one leg, the test measures the eccentric control of the gluteus medius as stabilizer of the hip and pelvis. A drop of the pelvis on the contralateral side of the stance leg indicates weakness of the ipsilateral hip abductors and results in a positive test. Test administration is demonstrated here. A study by Lequesne et al found the sensitivity and speciﬁcity to be 100% and 97.3%, respectively. This test was found to be a reliable measurement in detecting gluteus medius muscle tears as a contributor to greater trochanteric pain. Study of Hardcastle P. also shows that Trendelenburg test a significant predictor for greater trochanteric pain syndrome. FABER Test: (flexion, abduction, external rotation): With the patient lying on his back, the physiotherapist places the hip in flexion, abduction and external rotation. A positive test reproduces anterior hip pain. If the pain is posterior, a sacroiliac issue may be the problem. In the study of M. Lequesne, this test was found a Sensitivity of 88% and a speciﬁcity of 97.3 %. Due to this results, we can conclude that the FABER test is a good test for the diagnosis of tendinopathy and bursitis in great trochanteric pain syndrome. Noble Test: Is used to verify the Iliotibial tightness and to distinguish iliotibial tightness from outside pain of the knee, such as bicipital tendonitis, popliteus tendonitis, lateral collateral ligament strain, lateral meniscal tear or cyst, and osteoarthritis. The therapist then applies pressure on the lateral femoral epicondyle. During applying of pressure the leg of the patient is extended. If pain occurs on the lateral femoral epicondyle at 30 degrees flexion the test is positive. Test administration is demonstrated here. Modified Ober’s Test: Used to verify the Iliotibial tightness. The test consists of the patient lying on his non injured side. The therapist raises the upside hip and thigh into slight abduction. With the other hand the pelvis is stabilized to prevent flexion of the pelvis and internal rotation of the tight. Then the therapist allows the thigh to drop vertically into adduction. The test is positive if the tight does not go further than 10 degrees adduction. Renne’s Test: This test is used to test for the ITB friction syndrome. The patient stands on the affected leg. The patient makes a squat until the knee is in 30° to 40° flexion. As the knee is in flexion, pain will increase, creating a positive result. This was tested by Renne et al (1975). MRI provides very useful information in relation to bone and cartilage injuries, such as osteoarthritis. MRI allows a more detailed look at soft tissues (like muscles, tendons and bursae), which allows certain injuries to be excluded or confirmed. MRI can also be very effective in patients who tested positive for the Trendelenburg test (as suggested by Bird et al), and determine whether a patient is suitable for surgery. This intervention used to be carried out by open surgery, but now it is most commonly done arthroscopically. In this operation they first split the tensor fascia latae, because it lies over the greater trochanter. Then the tension on the iliotibial band is released and the inflamed bursa is removed. In a study of Fox et al. they found that arthroscopically performed trochanteric bursectomy is a minimally invasive technique that appears to be both safe and effective for treating recalcitrant pain syndromes as GTPS. The surgeon makes an incision at the level of the greater trochanter, and this incision will reduce the tension. This treatment has also been found to be effective but it only works on a short term. After a while the tractus will heal, and there can be a new friction due to the scar tissue. After the incision of the tensor fascia latae, the greater trochanter is reduced by making a longitudinal incision over the greater trochanteric and slicing the bone 5 or 10 mm in thickness. Afterwards the trochanter is repositioned more distally and fixated by means of two cortical lag screws with washers. By doing so, friction between the tractus iliotibialis and the trochanter major will be strongly reduced. A study by Govaert et al., concluded that a trochanteric reduction osteotomy is a safe and effective procedure for patients with refractory GTPS who do not respond to conservative treatment. Treatment with corticosteroid injections are also possible. Brinks et al. (2011) found a positive short term effect of the corticosteroid injections in primary care patients with GTPS, but on the long-term, these injections no longer had a significant effect. We can conclude that corticosteroid injections are a good solution to give patients an early relief of pain. This is done in order to break the pain cycle, to allow muscle strengthening and stretching, and to make some biomechanical adaptations to the lower extremity. By doing these corrections we are trying to remove or reduce the irritating force on the greater trochanter. First a wait-and-see policy is recommended. This means that the patient must rest and modify its activities (avoiding lying/sleeping on the affected area, no sitting with the legs crossed). The use of crutches or other walking aids (orthotics) may also be recommended. Iontophoresis, phonophoresis, Transcutaneous Electrical Nerve Stimulation (TENS) and cold laser are all possible therapeutic modalities that could be useful for GTPS but are not yet supported by sufficient evidence. 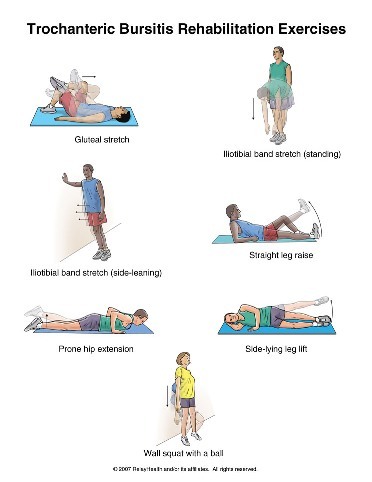 The objective of therapeutic exercises is to improve the flexibility and strength of the affected hip. By obtaining an appropriate range of motion and muscular strengthening of the hip, the muscular balance and coordination of the buttock and hip muscles will be restored. As a result, the risk of relapsing from Greater Trochanteric Pain Syndrome can be strongly reduced. Many patients with GTPS experience hip joint stiffness and restricted ROM on the affected side. Restoring normal hip ROM can be achieved with active, active assisted and passive range of motion as well as stretching. To work on the flexibility of the hip, a stretching of the illiotibial band (IT band) and the tensor fascia latae (TFL) is performed. This ensures that the compression and rubbing on the greater trochanter reduces. (Level of Evidence: 4) Furthermore, stretching exercises can be done to decrease length deficits of the glutei, hamstrings, quadriceps and piriformis. It is also needed to focus on strengthening of the hip abductors (especially the gluteus medius), external rotators end extensors, as well as the knee extensors and core muscles to improve gait, hip biomechanics and pelvic stability or control. Management of pain. Pain is the main a patient will seek treatment for GTPS. It is believed that pain is it the final symptom developed but should be the first symptom to improve. Managing pain is best achieved through relative rest, ice therapy, and techniques or exercises that unload the injured structures. Eliminating the compressive Load is vital to the recovery of GTPS. Encourage and educate a patient to avoid positions that lengthen the affected hip including crossing your legs, lying on either side, walking on angled surfaces and in the initial stages stretching the muscles on the outside of the hip. You can use an array of treatment tools to reduce pain and inflammation. These include ice, electrotherapy, acupuncture, unloading taping techniques, soft tissue massage to off-load the affected side. If the pain does not resolve, you can consider a local corticosteroid injection. As a patients pain and inflammation settles, focus is placed on restoring normal hip joint range of motion, muscle length and resting tension, muscle strengthening and endurance, proprioception, balance and gait (walking pattern). Treat comorbidities- osteoarthritis, labral tears can frequently coexist. The final stage of rehabilitation is aimed at returning to desired activities and functional independence. Specific treatment goals are needed to help a patient acheive their desired outcome and retrun to baseline level of activity. ↑ Mellor R, Bennell K, Grimaldi A, Nicolson P, Kasza J, Hodges P, Wajswelner H, Vicenzino B. Education plus exercise versus corticosteroid injection use versus a wait and see approach on global outcome and pain from gluteal tendinopathy: prospective, single blinded, randomised clinical trial. bmj. 2018 May 2;361:k1662. ↑ 2.0 2.1 2.2 2.3 2.4 2.5 2.6 Neil A et al (2007). 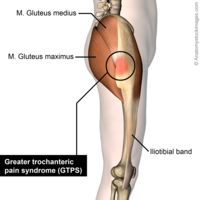 Greater trochanteric pain syndrome: epidemiology and associated factors. Archives of Physical medicine and rehabilitation, 88(8), pp.988-992. ↑ 3.0 3.1 3.2 3.3 3.4 Williams BS, Cohen SP (2009). Greater Trochanteric Pain Syndrome: A Review of Anatomy, Diagnosis and Treatment. Anesthesia and Analgesia, 108(8), pp.1662-1670. ↑ 4.0 4.1 Long S, Surrey D, Nazarian L. Sonography of Greater trochanter Pain Syndrome and the Rarity of primary Bursitis. American journal of Roentgenology, 2013; 201(5): 1083-1086. ↑ Grimaldi A, Mellor R, Hodges P, Bennell K, Wajswelner H, Vicenzino B. Gluteal tendinopathy: a review of mechanisms, assessment and management. Sports Medicine. 2015 Aug 1;45(8):1107-19. ↑ Shbeeb MI, Matteson EL (1996). Trochanteric bursitis (greater trochanter pain syndrome). Mayo Clinic Proceedings, 71(6), pp. 565-569. ↑ Fernandez E, Gastaldi P (2012). Hip pain from the orthopeadic point of view. European Journal of Radiology, 81(12), pp.3737-3739. ↑ Genth B et al (2012). Analysis of the sensory innervations of the greater trochanter for improving the treatment of greater trochanteric pain syndrome. Clinical Anatomy, 25(8), pp. 1080-1086. ↑ 9.0 9.1 Strauss EJ, Nho SJ, Kelly BT (2010). Greater trochanteric pain syndrome. Sports Medicine Arthroscopy, 18(3), pp.112-119. ↑ 10.0 10.1 10.2 Klauser AS, Martinoli C, Tagliafico A, et al (2013). Greater trochanteric pain syndrome. Seminars in Musculoskeletal Radiology, 17(1). ↑ Bard H (2009). Tendinopathy of the gluteus medius tendon. La Revue du practicien, 59(4), pp.463-468. ↑ Ho GWK, Howard TM (2012). Greater trochanteric pain syndrome : more than bursitis and iliotibial tract friction. Current sports medicine reports, 11(5), pp.232-235. ↑ 13.0 13.1 13.2 13.3 13.4 Lesquesne M, Mathieu P, Vuillemin-Bodaghi V, et al (2008). Gluteal thendinopathy in refractory greater trochanter pain syndrome: diagnostic value of two clinical tests. Arthritis and Rheumatism-Arthritis Care and Research, 59(2), pp. 241-246. ↑ VanWye WR (2009). Patient screening by a physical therapist for nonmusculoskeletal hip pain. Physical Therapy, 89(3), pp.248-256. ↑ Woodley SJ, Nicholson HD, Livingstone V, et al (2008). Lateral hip pain: Findings from magnetic resonance imaging and clinical examination. Journal of Orthopeadic Sports Physical Therapy, 38(6), pp. 313-328. ↑ Hardcastle P, Nade S. The signiﬁcance of the Trendelenburgtest. J Bone Joint Surg Br 1985; 67: 741–46. ↑ 18.0 18.1 Dubin J. Evidence Based Treatment for Iliotibial Band Friction Syndrome: Review of Literature. BioMechanics 2005. ↑ 19.0 19.1 Bird PA, Oakley SP, Shnier R, et al. Prospective evaluation of magnetic resonance imaging and physical examination findings in patients with greater trochanteric pain syndrome. Arthritis and Rheumatism, 2001; 44(9): 2138-2145. ↑ Lequesne M, Dijan P, Vuillemin V, Mathieu P. Prospective study of refractory greater trochanter pain syndrome. MRI findings of gluteal tendon tears seen at surgery. Clinical and MRI results of tendon repair. Joint Bone Spine, 2008; 75(4): 458–464. ↑ 21.0 21.1 Fox LJ. The role of arthroscopic bursectomy in the treatment of trochanteric bursitis. The Journal of Arthroscopic and Related Surgery, 2002; 18(7): 1–4. ↑ 22.0 22.1 Govaert LHM, van der vis HM, Marti RK, et al. Trochanteric reduction osteotomy as a treatment for refractory trochanteric bursitis. JBJS, 2003; 85B(2): 199-203. ↑ Davies J, Stiehl J, et al. Surgical Treatment of Hip Abductor Tendon Tears. JBJS-America, 2013; 95A(15): 1420-25. ↑ Rothschild B. Trochanteric area pain, the result of a quartet of bursal inflammation. World J Orthop, 2013; 4(3): 100–102. ↑ Brinks A, van Rijn RM, Willemsen SP, et al. Corticosteroid Injections for Greater Trochanteric Pain Syndrome: A Randomized Controlled Trial in Primary Care. Annals of Family Medicine, 2011; 9(3): 226-234. ↑ Kaprinski MRK, Piggot H. Greater trochanteric pain syndrome, a report of 15 cases. J Bone Joint Surg Br, 1985; 67B(5): 762-63. ↑ Rompe JD, Segal NA, Cacchio A, Furia JP, Morral A, Maffulli N. Home training, local corticosteroid injection, or radial shock wave therapy for greater trochanteric pain syndrome. Am J Sports Med, 2009; 37(10): 1981-1990. ↑ 28.0 28.1 28.2 Grumet RC, Frank RM, Slabaugh MA, et al. Lateral Hip Pain in an Athletic Population. Differential Diagnosis and Treatment Options. Sports Health: A Multidisciplinary Approach, 2010; 2(3): 191-96. ↑ Rowand M, Chambliss ML, Mackler L. Clinical inquiries: How should you treat trochanteric bursitis? J Fam Pract, 2009; 58(9): 494-500. ↑ Niemuth PE, Johnson RJ, Myers MJ, Thieman TJ. Hip muscle weakness and overuse injuries in recreational runners. Clin J Sport Med, 2005; 15: 14–21. ↑ 31.0 31.1 31.2 31.3 31.4 31.5 31.6 31.7 31.8 Wyss J, Patel A (2012).Therapeutic Programs for Musculoskeletal Disorder: Demos Medical Publishing. ↑ Furia JP, Rompe JD, Maffulli N. Low-Energy extracorporeal shock wave therapy as a treatment for greater trochanteric pain syndrome. American Journal of Sports Medicine, 2009; 37(9): 1806-1837. ↑ Klingenstein GG, Martin R, Kivlan B et al. Injuries in the Overhead Athlete. Clinical Orthopeadics and related Research, 2012; 470(6): 1579-1585.